Boxing Superstar and Undefeated, Unified Middleweight World Champion Gennady “GGG” Golovkin, 34-0 (31KO’s) and Undefeated Mandatory Challenger Dominic “Lights Out” Wade, 18-0 (12KO’s), met for the first time in front of the New York City media at Madison Square Garden, “The Mecca of Boxing”, to formally announce UNDEFEATED, their April 23rd showdown at the Fabulous Forum in Los Angeles and televised Live on HBO World Championship Boxing® beginning at 10:00 p.m. ET/PT. 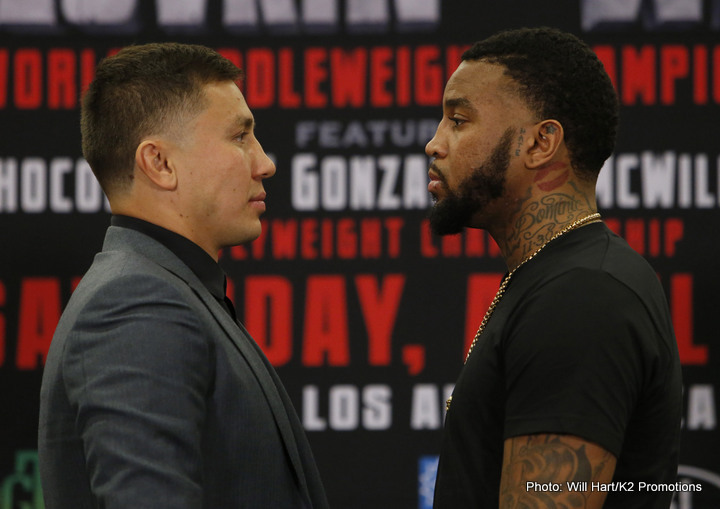 Golovkin vs. Wade headlines another great HBO World Championship double-header co-featured by Consensus #1 Pound-for-Pound Fighter in the World and WBC Flyweight World Champion, Roman “Chocolatito” Gonzalez, 44-0, (38KO’s) and world ranked challenger McWilliams Arroyo, 16-2 (14KO’s) of Puerto Rico. Tickets for the live event priced at $400, $300, $200, $100, $60 and $30, can be purchased through Ticketmaster (Ticketmaster.com, 1-800-745-3000) and the Forum Box Office. Here are the quotes from the participants. “Thanks to Al Haymon who brought us to this fight for which we had no hesitation. They could have fought someone else but they wanted the fight and we wanted the fight.